iOS Settings used to be easily accessed by going to the Settings app and then to the clearly labeled “iCloud” section of Settings, but modern versions of iOS for iPhone and iPad have changed how iCloud Settings are labeled and where those configuration options are located. 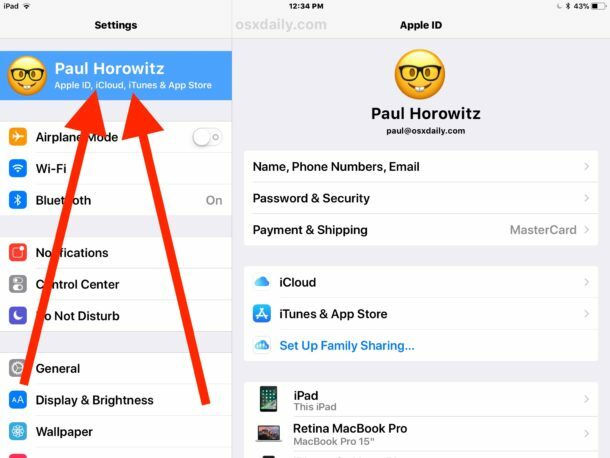 This has led to some amount of confusion with some users who look for iCloud Settings but no longer find a clearly defined iCloud Settings section on their iPhone or iPad Settings app. Not to worry, locating and accessing the relocated iCloud Settings on iPhone and iPad is actually easier than ever before, once you learn where to look in the latest versions of iOS anyway. So if you’ve been wondering where the heck iCloud Settings went to and how to find them, wonder no more, we’ll show you! A quick note: this tip may be really obvious to some of you who already know where iCloud Settings are found on an iPad or iPhone, which is great. 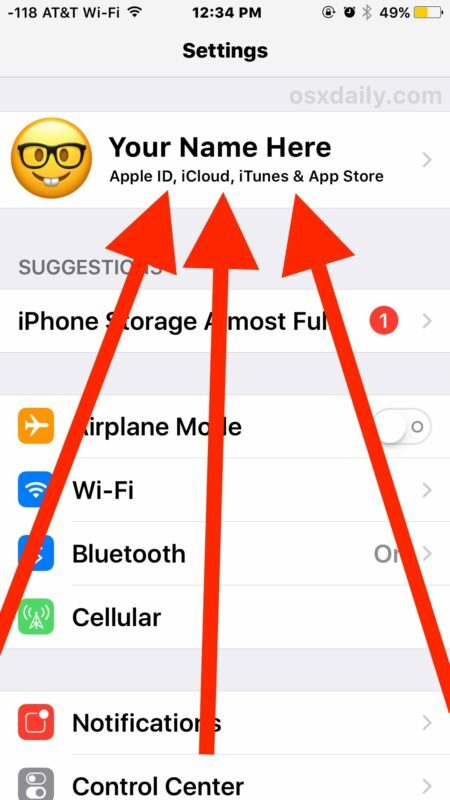 But after walking an acquaintance through the process of finding the relocated iCloud Settings in the latest iOS releases, I realized this is probably a helpful tip to share broadly with other users too. Sometimes the obvious is less than obvious, after all! The screen shot above shows what to look for to find iCloud Settings in iOS on an iPhone, whereas the screenshots below show where to find and access iCloud Settings on an iPad. 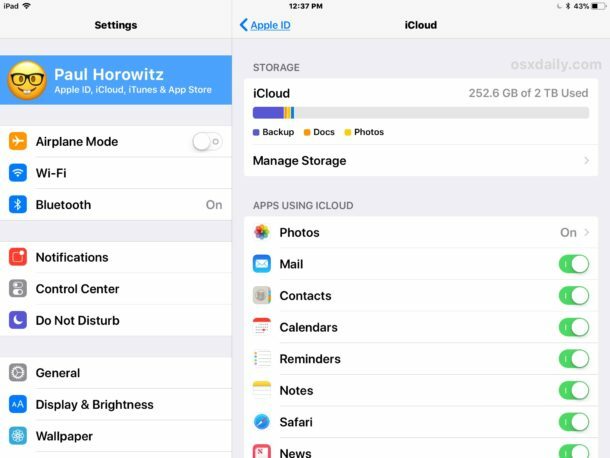 Where are iCloud Settings in iOS now? The iCloud Settings are now a subsection of a broader Apple ID settings section of the iOS Settings app, but all iCloud settings options are now contained within this section of the Settings app, including controls for which apps can use iCloud, access iCloud, your iCloud storage usage and storage plan and how to upgrade iCloud storage plans or downgrade too, where to initiate manual iCloud backups, iCloud backup information and iCloud backup management, Find My iPhone / iPad / Mac settings, keychain settings and iCloud Drive options, and literally every other iCloud related setting option that used to be contained within the old obvious “iCloud” settings section in iOS. Why is there no obvious “iCloud” Settings in iOS anymore? There is, the iCloud Settings remains in the iOS Settings app, but now all iCloud Settings are stored within a subsection of an Apple ID management settings screen. Apple has consolidated iCloud Settings into a broader general settings for a users Apple ID, name, phone number, email, password, security options, payment options, iCloud syncing, backup, storage, and configuration, along with iTunes and App Store settings – everything is now in one single location to make things easier. And while this may be easier to have all account type settings in one location, old habits can be tough to break, and changing the location of something can lead to some confusion. Thus why it can be helpful to point out where the same old iCloud settings are now located. Another option on the latest versions of iOS is to use the iOS Settings Search feature to look for “iCloud” which will also allow you to jump immediately to iCloud settings overview panel, as well as more specific iCloud settings elsewhere in the Settings app. Keep in mind the iOS Settings search feature works best on the most recent versions of iOS, so you may need to update the device to gain some of those capabilities. Another great tip, thanks Paul. I haven’t needed iCloud settings for a while so haven’t noticed the change. how do I change her name and iCloud address? looked for like 15min…thank you for helping me not lose my mind! looked for like 20 minutes…not joking…thx so much for the tip!!! I cannot access my name and iCloud acct as they are faded and unresponsive.